Give louver doors that have seen better days a makeover. Swap out the louvers for wood panels. It's a relatively easy-to-do exchange and a great way to retrofit your doors. Add paint or stain for a new look. Use decorative molding strips with carvings or multiple molding strips to make your doors even more distinctive. Use wood panels to update the look of louver doors. Examine the doors to determine how the louver slats are attached. Some attach with wooden dowels, others with metal dowels. Use a jigsaw to cut away slats attached with wooden louver pins or dowels, or lightweight metal pins or dowels. If the louvers are attached with sturdy metal dowels, use wire clippers to remove them. Remove the hinge hardware for the door with a screwdriver. Lay the door(s) on a sturdy worktable. Sand the edges smooth where you removed the dowels. Sandpaper will work for wood dowels, while metal dowels might require a steel file. Measure the width and length of the opening where the louvers were to determine the size for the replacement panel. MDF or plywood is a good choice for a panel to insert on exterior doors. 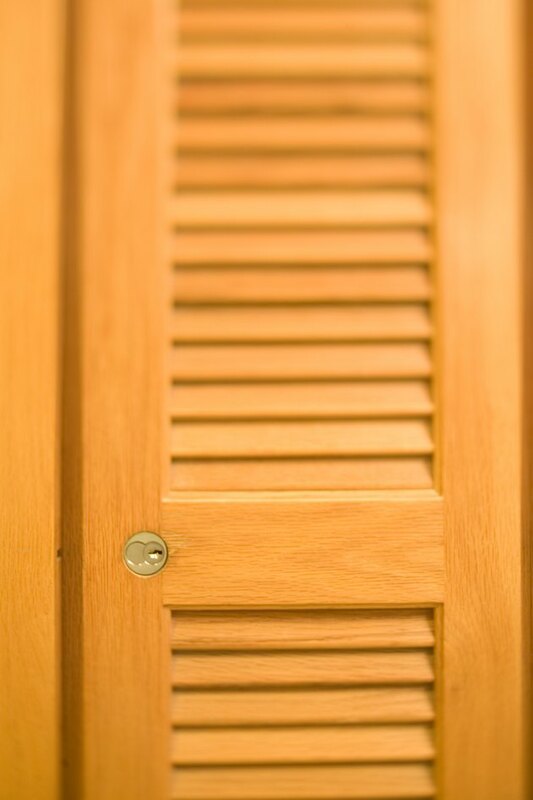 Choose MDF or fiberboard to replace louvers for a lightweight interior door such as a closet door. Cut the wood with a circular saw according to your measurements for the panel space. Use the length and width measurements to determine how many rabbeted molding strips to purchase. The strips will keep the replacement panel in place on the door. Prime and paint or stain the molding to your liking and allow it to dry, according to the manufacturer's instructions, before attaching it to the door. Lay the molding strips along the vertical and horizontal edges of the opening once they are dry. Mark the strips at a 45-degree angle so the molding joins neatly. Use a miter box to cut the molding strips according to your guide marks. Place the grooved edge of the molding strips against the cut edges of the door panels. Sand the molding edges, if needed, so the 45-degree angles fit snugly. Apply a thin bead of contact cement close to the edge of the door opening. Place the molding strips in position and press them to bond them to the door surface. Use 3/4-inch nails, hammered 1 inch from the 45-degree edges, to secure the molding to the door. Apply wood filler, if necessary, to fill in any gaps at the angles. Allow time for the contact cement to dry according to the manufacturer's directions. Prime and paint or stain the wood panel while the contact cement is drying. Allow the paint or stain to dry. Once they have dried, turn the door panel over and insert the wood panel. Attach the molding strips, repeating the process used in Steps 7 and 8. Reinstall the door to complete your project. Cheryl Munson has been writing since 1990, with experience as a writer and creative director in the advertising industry. She holds a Bachelor of Arts in journalism with a focus on advertising from the University of Wisconsin in Madison.